Fire Gem is an Upgrade Material in Dark Souls 3. 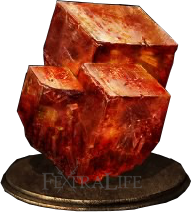 A gem of infused titanite. Found in rare cases inside demons. Fire weapons inflict fire damage, but lose scaling effects. Infuses a Weapon with Fire damage, but removes the stat scaling. The fire damage portion of weapons can be further increased by wearing the Fire Clutch Ring. Fire also has an additional stun, stagger or knockdown effect against most enemies. This is most notable on Lycanthrope Hunters, Pus of Man, Starved Hounds and Corpse-Grubs. The Fire Gem, along with Deep Gem, can raise elemental defense for shields. The burial gift description states that it is used for upgrading fire weapons when it is actually used only for the initial infusion. The burial goofy description says "... used to upgrade *to* fire weapons..." Which is accurate. It&apos;s confusing for people unfamiliar with the mechanic but it is not incorrect (as this page makes it seem). A little tip. Dont upgrade your weapon until you infuse the fire gem, then start upgrading the weapon. Lets say you have a weapon the does base 100 damage, then you infuse it. So its might be around 80 physical and 80 fire. Then upgrading it might give you a plus 10 per upgrade. So a plus 10 weapon with fire would have 180 physical and 180 fire. It might be specified that they drop from the Undead Workers that throw fire bombs on the building where you find Cornyx. I&apos;ve not had them drop from other workers. Does upgrading a weapon down the standard path and THEN infusing it stack the damage? Or does infusing a Long Sword do the same thing as infusing a Long Sword +3? Try Fire Black Iron Greatshield +10 for 99.6% Fire damage reduction. Does the weapon infused with a fire gem look like it&apos;s on fire? It removes scaling... so what? you don&apos;t have stats at the start of the game anyways, as a caster you don&apos;t want to have str/dex stats for a long long time.You can change item&apos;s infusion anytime is no hassle.You&apos;ll find many more gems then before.People posting here have not tried this item I suppose. It offers superior damage until upgrade level +4 and stats like dex/str well over 20 points. So it&apos;s the best starting gift as early on you should really work on your health bar to have decent life expectancy. It&apos;s better than a raw gem until you can buff your weapon with great spells. The village workers in Undead Settlement drop Fire Gem. Is the gem one use only, or do I get to have fire weapons with everything? id like to start as herald with teh gem, then get a halberd and infuse it with fire. will that be a good thing? Interesting system that is being put into place here. It seems that int builds are the only ones that actually get magical scaling on any weapons that the want. For Fire/Dark damage that is mixed-magic or faith based, you get no extra scaling. Maybe the fire/dark spell buffs are powerful and cheap, and they expect players to use them more often. Then you still have an advantage when you have that existing flat elemental damage, which makes you better at penetrating defenses. But still, int getting magical scaling weapons and faith not?